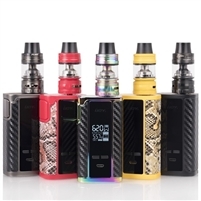 The SMOK I-PRIV 230W TC Box Mod is a highly impressive vape device with advanced technology functionality, featuring an AI-powered chipset capable of Voice Control System and compatible with dual 18650/20700/21700 batteries. The Aspire Skystar Revvo 210W Touch Screen Starter Kit is built for the modern day era, featuring a timeless chassis design and touch screen functionality of the Skylar 210W Box Mod to pair with the revolutionary Revvo Sub-Ohm Tank. 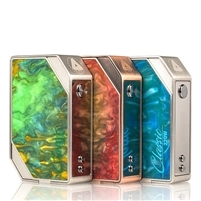 The Flawless Tuglyfe DNA 250W TC Box Mod is a beautifully crafted device built around the Evolve DNA250 chip set and features a new ergonomic chassis and built-in 1200mAh battery.